The average business professional has a multitude of projects on their plate to deal with at the same time. Modern workers get interrupted several times an hour amounting to a total of more than two hours a day. You know what I’m talking about. I compiled tips for better managing work related stress and help you maintain a good work-life-balance. Catching the subway during rush hour, preparing a presentation for your latest project, replying to all the unread e-mails upon returning to the office after your well-deserved vacation – all of these are quotidian stressful situations. There are two sides to stress: One that helps our body and mind not only to master challenging situations but that even boosts our concentration, helping us to outperform. And then there is the negative side to stress that can be dangerous and cause seriously negative effects. Being able to control stress isn’t something we can realize overnight. 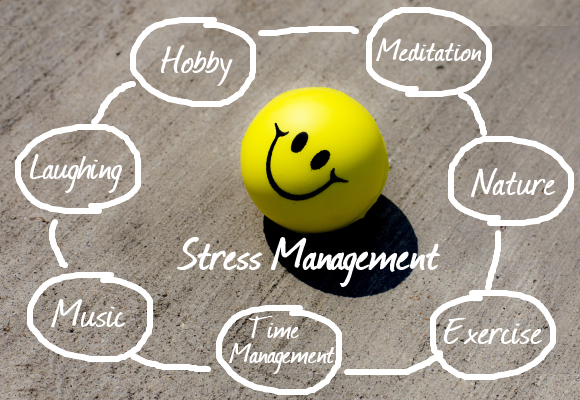 Stress affects both body and mind, and therefore, we should make changes for several aspects of our life – step by step. The issues we are facing are rooted in the stressors, the conditions that trigger our experience of stress and cause the feeling of being out of control. So first, it is essential to step back and take in the full picture in order to identify what the underlying issues are. Only like this can we take back control over our own situation. A healthy lifestyle is nuts and bolts when dealing with stress: a sane body contributes considerably to your well-being. It all starts with a well-balanced diet, because food is the body’s “fuel”. That also includes avoiding excessive coffee consumption – instead, try to drink more water and have a fruit snack.. Another important factor is working out on a regular basis. You can exercise before or after work at the gym closest to your office. While doing sport, our body produces the “happiness” hormone serotonin which boosts the temper. Moreover, make sure that you you’re your body and mind enough time to recuperate at the end of the day – this is the prerequisite for a fresh start the next morning. Don’t underestimate the power of social life: Keeping in touch with friends and family is crucial and reserving weekly time slots for your social life will help you balance your work life. The same applies to your hobbies, they are your favorite free time activities for a reason after all. Use your time efficiently with the help of time management. This includes prioritizing the projects on your desk and it might require you to gently say no to additional requests. Try to avoid multitasking and instead of juggling several things at a time finish assignments one by one. Remember that breaks are meant to give a little time out and room for relaxation. So don’t spend your lunch break at your desk but rather meet with your colleagues and go outside. The switch of scenery will help you to see the projects on your desk from a different perspective and it might trigger the brilliant idea you need to complete the project at hand. That said, there are situations we are incapable of overcoming all by ourselves. In such cases, don’t be scared to ask for help, chances are pretty good that you are not the only one feeling overwhelmed with work. Talking to your close friends or family and telling them about your issues might help you find a solution to your problems you haven’t thought of before. Especially at work, disagreements should be sorted out as soon as possible to assure a successful workflow. In general, a positive attitude is very helpful when encountering stress. There will always be some situations which cause stress, but the thing is that you can cope with it in different ways. Even a tidy workplace can contribute to it. Last but not least, managing stress also means avoiding unnecessary stress like arriving late to an important meeting. Coping with Stress at Work: Tips for Preventing and Reducing Stress - InLoox • Copyright 1999-2019 © InLoox, Inc. All rights reserved.